Unit 17 Lot 67; TOT ID# 1616. This beautiful oceanfront home with expansive whitewater views was recently extensively remodeled and features 4 bedrooms (2 Kings—one with its own gas fireplace/stove, 1 Queen and a combination twin/full bunk bed with single twin in the 4th bedroom) and 3 full bathrooms. Only 3 minutes’ walk from Pebble Beach, this home is great for all kinds of wildlife watching—pelicans, hawks and all kinds of local and migratory birds fly by; deer, fox and raccoons wander by; and whales are easily spotted from the commanding ocean views afforded by the home—or relaxing; be it from either of the private verandahs off each of the king bedrooms, the 2nd story deck or large ground floor private deck, garden and gas grill barbeque area. Enjoy an invigorating bath in the Jacuzzi in the master bedroom’s ensuite bathroom or take a long soak in the hot tub on the private outside deck in the garden courtyard from which you can watch the ocean a mere 100 yards away, the wildlife or the sunset. Just refurnished with a mixture of Asian antiques and eclectic artwork as well as new furniture and electronics complete with iPod friendly stereo system and combination Blu-ray/HD/DVD/CD players and 32” flat screen TVs in three of the bedrooms, one with HD availability. In addition to a 40” flat screen TV with high definition and combination Blu-ray/HD/DVD/CD player, the large Media/Recreation Room also features its own pantry area with coffee maker and refrigerator. 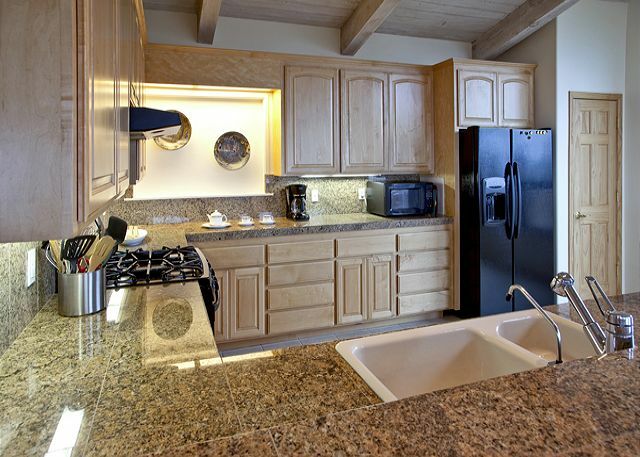 The large, open kitchen enjoys outstanding whitewater views and is fully equipped. 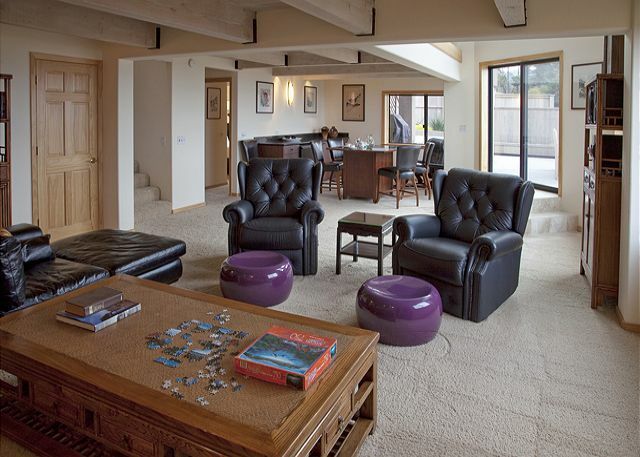 Due to the close proximity to the ocean bluffs, homeowner suggests guests age 10 and older occupy this home rental. Wireless Internet and domestic long distance calls are provided free of charge. Bed linens and towels are included with this rental. Our stay couldn't have been better. The house was lovely and large enough for all of us to be comfortable. The views were spectacular ..
We absolutely loved the Edgewater house! We came to the Sea Ranch for a family reunion and a 95th birthday celebration for my aunt who is an original home owner since about 1972. There were 9 of us: my husband and myself, our son & daughter & their spouses, and our 3 little granddaughters. 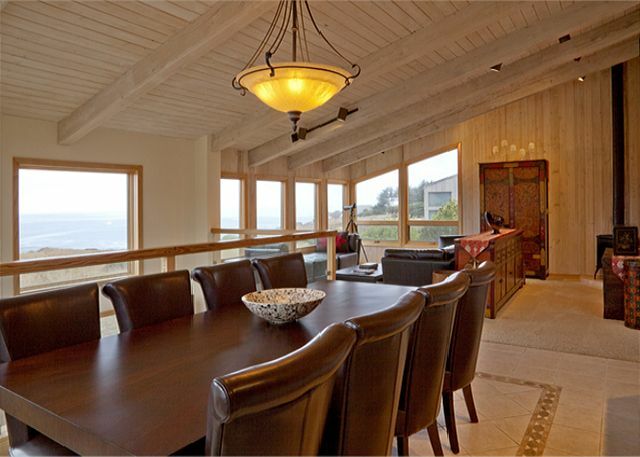 The house is gorgeous, spacious and immaculate, with incredible ocean views from almost every room. 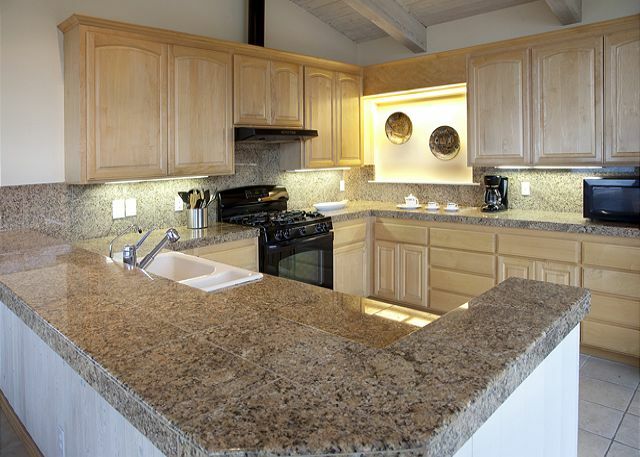 The kitchen is well-equipped, bathrooms beautiful and everything in working order. As our kids said, this was probably the nicest house we ever rented! lovely home: clean, comfortable, nice view, good beds, well appointed. Had a great time in this comfortable and well appointed home. 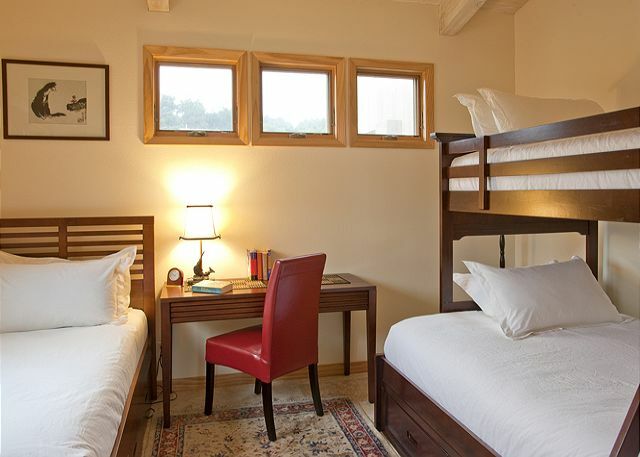 We had four couples and all had privacy (although the "kids" had a little less luxury in the double at the bottom of the bunk bed). Once again, we had a wonderful three days of eating, visiting, playing games, walking the beach, sooo enjoying the ocean - and our precious time together as a family. We started this "tradition" three years ago, and plan to continue for as long as we're a family!! Thank you, Sea Ranch, for just being there!! This is a well-stocked and efficient four bedroom home. We had 8 people and we're very comfortable! Beautiful location and house. Furniture in living room up stairs was very low with no back support. Beds were comfortable. My family and I enjoyed, beyond measure, our stay in Edgewater Jan. 13-16. It was absolutely fabulous! The home was far more than we had anticipated and fit our 10 family members (all adults) to a "T"! We hope to make this an annual experience!! It was our third stay at Edgewater. We go to Sea Ranch every fall for our get away. We cook great meals and enjoy each others company. We had a great rental experience house was clean, comfortable and we had a great stay. We would definitely recommend this property and use it again. We enjoyed being close to the beach and all the great ocean views. Our family had a wonderful time as well and were very comfortable. This was our second stay at Edgewater. Just as great as the last one. Worth the extra money. Lots of room. Well equipped kitchen. Great view of meadow and ocean. My whole family loved the house and the spectacular view. We all want to come back next summer. The place was super clean and beautifully decorated. I would suggest the rental company give an updated list of what's supplied in this home and correct numbers at the house for contacting management. The rental staff were very pleasant and accommodating . This was our second stay at the Edgewater for our family of 8. The house is spacious and well equipped. It was great to have the beds made and towels provided. The location is perfect, just a short walk to beautiful Pebble Beach. If you want privacy as well as community, this is the place! This is a great multilevel house. Open, clean, great kitchen, bbq, hot tub. Great location especially for hiking the trail. You could go either north or south and have the most beautiful of views. There is a small sandy cove very close to the house. It was very comfortable for all of us. The views from the deck were stunning. A great place to hang out with friends/family. It was a very pleasant weekend in this wonderful home. gorgeous house with stunning views and coast access. Perfect for friends / extended family stays because it has three separate wings, each with bedroom / bathroom. It is a great house with a really nice layout. This home accommodated 3 families! Plenty of room to curl up with your kindle and relax. Close to pebble beach to have a sunset toast! small town of Gualala . We were fortunate to have a week of perfect weather.This was our 35th year at searanch with my two childrean. Searanch is a very special to all of us. Beach Rentals does a great job, doing everything to making sure your stay is enjoyable. Perfect spot for 3 couples And 3 teenagers. Great location with walking access to multiple beaches. Amazing view from the main floor and lots of space for everyone. Would definitely go back to this home for a large group. Our group stays at the Edgewater a lot for Abalone diving trips. The property and house are outstanding and includes all of the amenities to make the stay excellent. The only down side is that we lost access to the garage which we have used in the past to store dive gear. The Edgewater house is perfect for a large group. Lots of space and comfortable seating. 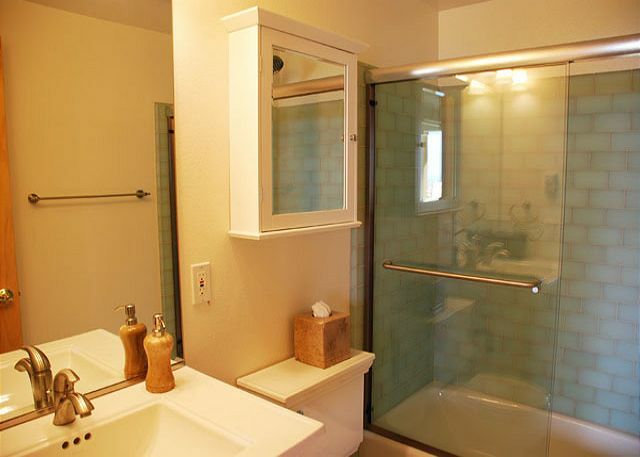 Beautiful bathrooms and comfortable beds! The master suite is perfect! Wonderful decks with stunning views. The upper level is a wonderful gathering place to enjoy the views. wonderful getaway at the Edgewater! this was an annual getaway for four couples who like spacious quiet private immaculate accommodations, with easy access to the outdoors. 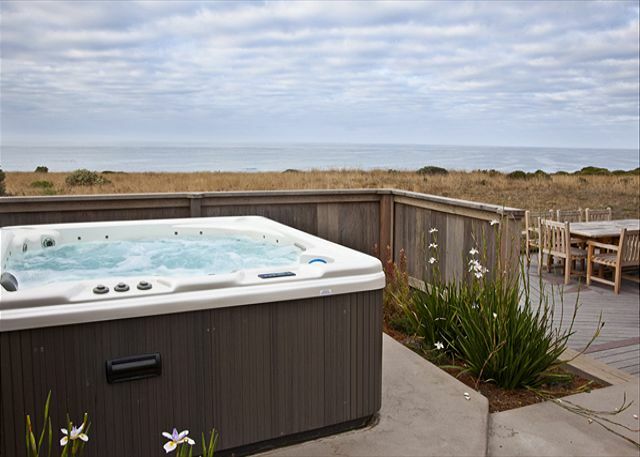 a hot tub is also an appreciated amenity, and, of course, an ocean front location is ideal. this property met all our requirements, and the rental staff were very responsive and gracious. Had a great time. Beach Rentals did a great job to keep things smooth. The house was in excellent condition. The view was right on the ocean, but not near any rocks, so no waves to watch, but quite serene and pleasant, if not incredible. I have stayed at a least a dozen houses in Sea Ranch Edgewater was by far the most spectacular. The location was perfect and private. The house was beautifully maintained and tastefully decorated. The linens and towels high quality. We spent one entire afternoon after our long walk on the bluffs sitting on the front deck of the house drinking wine and listening to music. I would definitely go back to this house!!! We certainly appreciate your efforts to resolve one of the showers being broken. The staff was really professional in handling the situation. Just wish the area was closer to Reno, NV. It is a long 6 hour drive. Very nice and comfortable. Lovely view. Absolutely loved the house - great layout, comfortable beds, good kitchen. The only issue was a plumbing issue with the second bath on the 1st floor (not the master) and the laundry. Major leak making them unusable. I'm sure that has been fixed. Edgewater house exceeded our expectations in amenities, location and condition. Everyone in our group is planning to return to this house collectively and individually as soon as possible. Our family had a great time. It started with beach walks, ocean views and ended with a wedding proposal!!! Great times and we will be back. Thanks again. Beach Rentals are friendly and professional. The edgewater house was a well appointed house with excellent style. This was the perfect house for two families plus Grandma and Grandpa. The kids loved playing ball in the back yard and what a beautiful background for us to keep an eye on them! The house is spacious, great floor plan, well-stocked. We couldn't have asked for anything more! Loved it. Worked out great for our family. Only bummer was the dishwasher, which ran LOUD and LONG. Other than that, no complaints! I have been renting homes at sea ranch fo 35 years and this is the best of all the houses we have rented . My only complaint was the noisy hot tub motor turning off and on about every 20 min during the night time hours when you are trying to sleep. I hope the owner does something to rectify this problem. This is one of the nicest rental houses at Sea Ranch and of course, Beach Rentals did everything right to accommodate us. we look forward to our next stay at Edgewater. We had a wonderful three days with family members of all ages. This house is large, but the nice thing about it, besides the overall great ambience is that there are many areas with some privacy so the whole group is not in one big room all the time. It is right on the ocean, but with enough room in front that you don't have to worry about anyone stepping off a cliff. We loved it! Thoroughly enjoyed our stay at Edgewater. The house was beautiful and spacious, located right on the bluff. We were there for a friends bachelor party. We are all divers and wanted to get away on the water where we could free dive and eat a little abalone, as well as take some back for the wedding. Edgewater was perfect . We stayed in this home for a family reunion. The layout of the home and location were ideal! It was a perfect place for us, and a perfect weekend! The only things I would mention is that the knives in the otherwise well equipped kitchen were very sub standard, and the carpet on the stairs to the upper level is difficult to keep clean. This vacation home was perfect for our group. It has a wonderful layout and is well-equipped. The view is spectacular. Beautiful home and perfect location. Great getaway for families and great friends. We love Edgewater. Have stayed there twice for a week each time. The Edgewater "Fabulous Family Get-Away"! Celebrating our son's 40th birthday as a family could not have been better than at Sea Ranch! The 2 rental homes were perfect for our size family, the golf was a big bonus for our son and the setting was a gift from God! 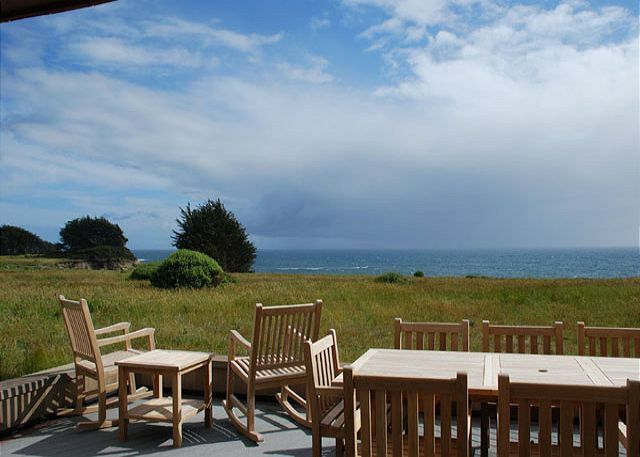 This is the perfect house for a large group at Sea Ranch. We're delighted you have it on your rental list. Beautiful home with classy and comfortable furnishings. Watching the wildlife from the extensive ocean-facing windows was a delight! For a large group, it was a perfect. A great place to stay. Beautiful home. Positives: Big house, big kitchen, nice master sweet, great views, incredible backyard deck/patio/tub, extra refrigerator in garage. Negatives: Single car garage that has very little room do to a lot of stuff in it. Wish there wasn't a 12 year old and older age restriction. Was great for a guys getaway weekend but, my family and I have been going to Sea Ranch for 25 years now and it's hard to find nice 4 bedrooms houses to stay in as I have a niece & nephew that are 6&8. Not to mention I am getting married this year so there will be more little ones to follow at some point. Oh well it will just have to be a great house for those occasional all adult weekends. Very pleased with Beach Rental's professional staff, and fairness and simplicity of rental agreement. The Edgewater exceeded our expectations; well furnished, high quality linens, comfortable beds and well appointed kitchen. This was a great place to be for the week. The kitchen and dining area weren't as spacious as we thought from the pictures but the downstairs TV room was big and great for lots of people to hang out in. Overall a wonderful week at Sea Ranch. Loved the jacuzzi! We needed an instruction book for the TV (Direct TV for Dummies)... too many remotes and too many idiots in the media room. But, our stay was not about watching TV, so that was a very minor problem. We had a wonderful time, the view was fantastic and we'll definitely be back. Very friendly and husband had just passed away,so it was the first trip without his dad. 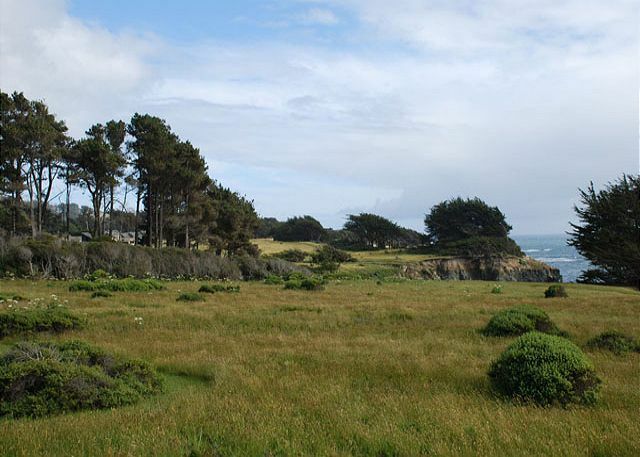 We've love Sea Ranch and have been visiting since 1995. Your staff was so friendly and really helped our family without even knowing our situation...Thank you so much you all are great! God Bless. This house is spacious and well appointed and located very close to two very nice beaches. The views are captivating. We had a glorious time at Edgewater. Our only complaint was the lack of hot water in the master bath, rendering the jacuzzi tub useless. This was a special weekend for our family in a lovely environment. great location, luxurious home, very relaxing and quiet. I loved everything about the house and the location. The service from the office was excelent, everyone was very nice and very helpful. We will come back next year. Thank you. Wonderful family experience in a perfect setting...the home was well equipped, well located and with an excellent property management team to support it...a glass of wine on the deck or a jacuzzi at sunset...all possible from this 5 star home. This was our second stay here. The property was as nice as the year prior. Owner takes good care of this one and even though a bit pricey, the location, superbly stocked kitchen, decor and condition is worth the extra price. The only thing we didn't like about this property were the plug-in air freshners. They really assaulted your nose and lungs, but after we unplugged them all and put them in the closet, everything was lovely. Great property! Great home with lots of room -well designed outdoor living space as it stayed calm in the outdoors even when it was windy outside. This is a fantastic place - first rate in all respects. I have been coming to Sea Ranch 2-3 times a year for 22 yrs. I have rented numerous homes and I can say without hesitation that this one is my new favorite. We stayed at Edgewater for 3 nights in June celebrating our daughter's 16th birthday with 8 teenage girls. The home and ocean views are even more spectacular than in the photos. Big plus: the private out-of-the-way downstairs master suite with 2 large cozy armchairs, gas stove and private patio with lounge chairs and view of the ocean. A perfect place for mom & dad to be out of range from all those teenage girls! Beautiful dining areas with spectacular views both inside at the large dining table with leather chairs and outside at the large teak table on the downstairs deck and upstairs at the smaller table that was a perfect perch for morning coffee! We loved this house! Thank you Beach Rentals!